Comprised of top-level and sub-system templates and interfaces, the VeSyMA library from Claytex is the cornerstone of a group of libraries which make up a complete, multi-domain solution for on-road vehicle simulation. 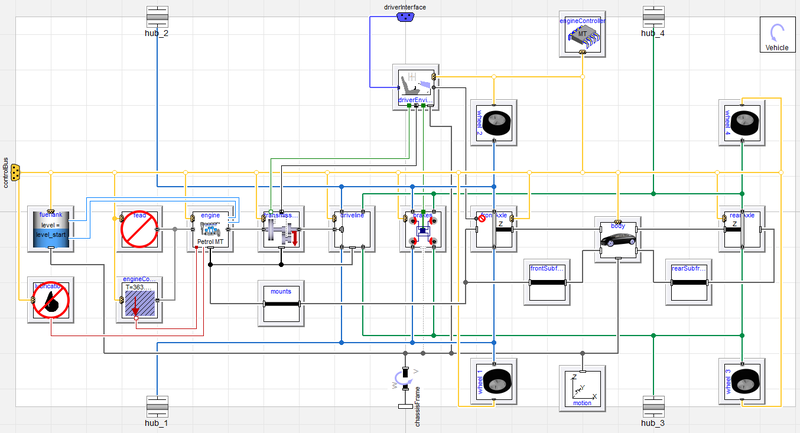 Utilising a modular structure based upon the open-source Vehicle Interfaces library, the VeSyMA library offers the user an intuitive vehicle systems engineering tool, focusing on straight-line studies and investigations. Additional libraries, which will be introduced in further blog posts, utilise the interfaces (components and vehicle templates) defined within the VeSyMA library to come together as one, enabling the user to delve deeper into various areas of vehicle engineering, such as vehicle dynamics, powertrain performance, driveline simulation and more in a modular approach. This modular approach enables a complete solution to be offered, but refined to include the specific elements of interest to the user, with the obvious benefits of clarity of thought and reduction in both computational and intellectual overheads. Rationalisation of the vehicle as a collection of individual sub-systems, which interact with each other, is fundamental to this approach. At the top level of the vehicle, these sub-systems can be observed (see Figure 1); the VeSyMA library providing example models of sufficient complexity to enable straight-line investigations of vehicle performance to be conducted. Each of the subsystems has a vast range of components which plug into the model, either found in the VeSyMA library or another of the subject specific libraries offered by Claytex. Driver models are considered external to the vehicle itself, with multiple models to suit many applications; open, closed and test driver models are available for both automatic and manual vehicles. Each transmission-specific driver model can be used on any vehicle thanks to normalised driver controls being converted into control actions in the vehicle-specific driverEnvironment, which is part of the vehicle model. Control algorithms for the likes of the transmission (if automatic), engine or hybrid/electric system are modelled as separate subsystems, with the ControlBus carrying the relevant control signals for the subsystems in much the same way as a CAN bus. The road model used by the vehicle can either be a flat plane or graded, where the driver controls the vehicle due to its own speed/time targets, or the road can have an embedded target velocity the driver strives to achieve. Figure 2: Typical experiment layout found within the VeSyMA library. 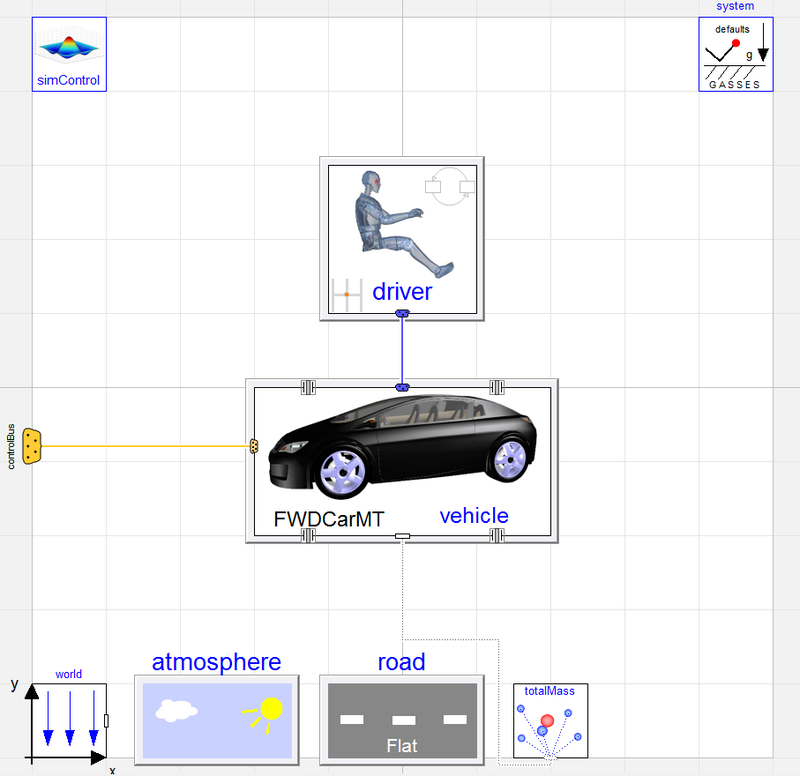 Note the external driver model, along with a selection of other blocks create a full simulation environment for the vehicle. Features such as the totalMass block calculate the total mass of the bodies within the full vehicle system, whilst the SimControl block controls various functions of the simulation, such as the domain (time or frequency) the simulation is conducted and time during the simulation tables are read. A constant atmospheric conditions model is available within the VeSyMA library. Multiple vehicles can be used within the same experiment if desired. External hub flanges are present on the vehicle model to enable the user to add simulation specific sensors if desired. At the heart of the VeSyMA library is the Vehicles package, containing 5 pre-built vehicle models ranging from a manual transmission, front wheel drive (FWD) small family car to a large, rear wheel drive (RWD) hybrid equipped family car along with an entirely electric RWD executive saloon car. Within these models, the VeSyMA library offers a vast range of idealised powertrain systems, from mapped diesel and petrol engines (including multibody and frictional effects) to torque actuator systems; a table based DC motor is also available. These propulsion systems can be connected to multibody ideal manual, automatic or an automated manual dual clutch transmission, all of which in turn can be coupled to a 1D front, rear or four-wheel driveline model. Fuel usage can be modelled in two ways, depending upon whether a conventional combustion engine or electric/hybrid drive train is selected. The Fuel tank model features a mass which varies in relation to the consumption calculated in the engine model using the BSFC method; the centre of gravity of this mass also moves depending upon the fuel level in the tank, with the inertia tensor updating automatically. In addition, static and dynamic state-of-charge (SOC) battery models are also available. Combustion engines also feature constant temperature lubrication and cooling circuits, along with front engine accessory drive (FEAD) loss models. Deceleration is achieved from a choice of 1D independent brake models, from idealised to hybrid compatible, brake-by-wire and single/twin pseudo-hydraulic models. Each library provides specific in-depth detail regarding their respective subject matters, and can be purchased individually to build up a complete, modular vehicle simulation solution. Feel free to contact sales@claytex.com to get more information on the VeSyMA Library.